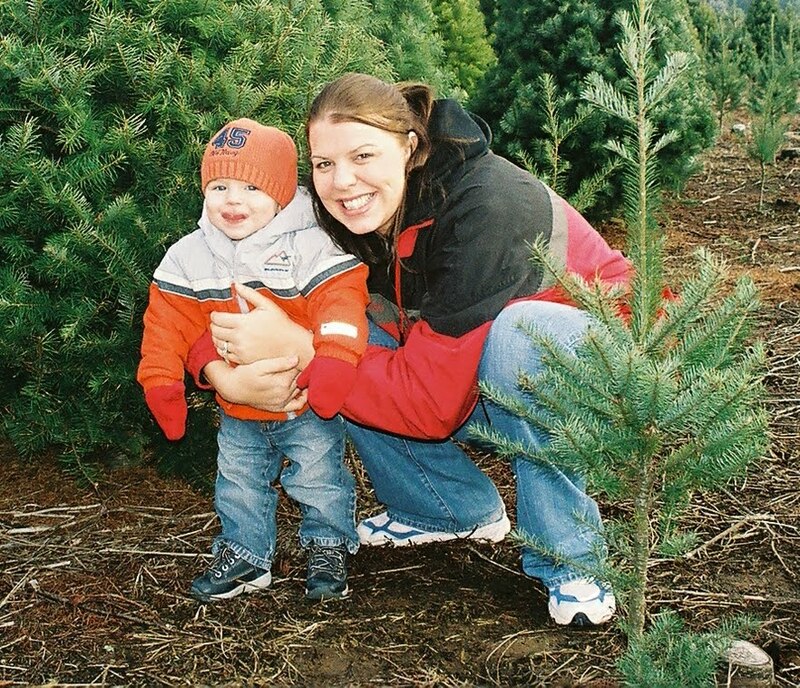 I had GREAT plans for 2010 recaps of goals, accomplishments and pictures...but as a Working Mom on break from the Big Girl Job I have a LOT to fit in.. Oil change and car service, shop for new Living room furniture, burn down the house... etc.... Wait what?? 1. Lost my Marathon and Runner girl decals off the back of my car at the Car wash.
3. Dropped the salt shaker on my spoon holder and it shattered. 4. 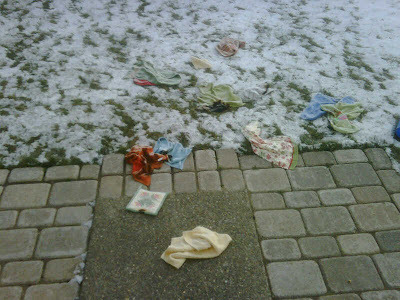 And to top it off I used kitchen towels to pull dinner out of the oven... I always use pot holders not sure what I was thinking. I put the towels in the drawer. Muscle Man smelled something and saw smoke, opened the drawer and WHAM towels on FIRE!! All the towels in our drawer were lit up, he tossed them on the floor then we threw them in the snow.. The weird thing was I was thinking the other day that I wanted matching Kitchen towels. So blessed that all we lost were towels and that the Little Studs were upstairs.. here is the damage.. UGH!! 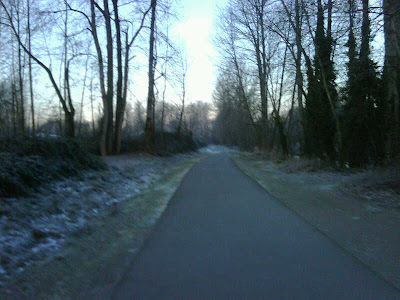 This morning I finished up 2010 with a RUN. My Goal was higher, but 2010 threw me some MAJOR PUNCHES so I am proud of those miles. FYI the 2010 spreadsheet closes tomorrow morning, so email me if you need the link, anyone with no miles listed will be deleted from the Blog post on 1/2. 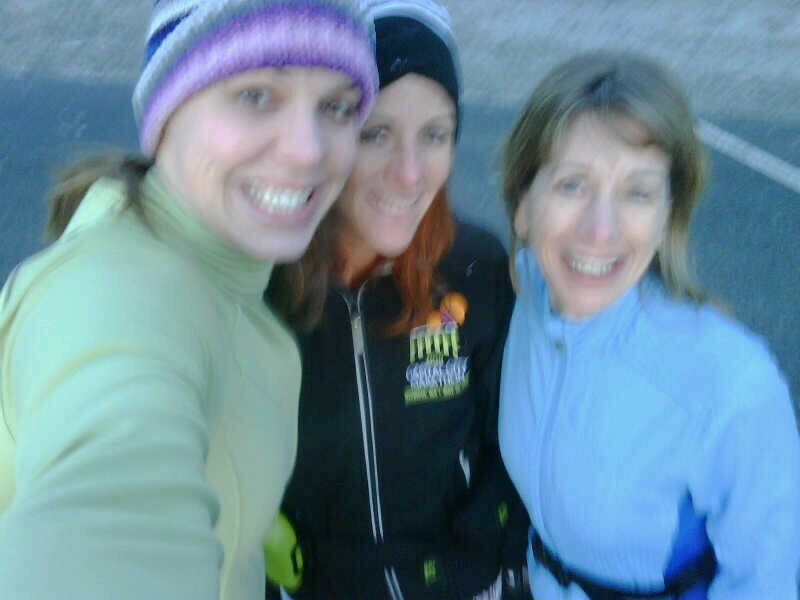 I met Tammy, and Heidi at 8AM and 22 Degrees...BRRRRR!!!! My camera phone was blurry but it was cold so no retakes. We opted to try a new trail (to us) along the Puyallup River, new scenery.. It was a little slick, but the snow has covered everywhere so I am guessing this trail was one of the few options. I was TIRED from the get go, I HAVE NOT RUN ALL WEEK, OOPS!! Tammy and Heidi are in shape and zoomed along. I am 11 pounds heavy and have not run much lately, but I will get back on track ASAP.. When we set out the goal was 12 miles, UGH, so when the trail ended at a little over 4 miles and we had to turn I was happy... I told the girls they could drop me off at 8 miles. 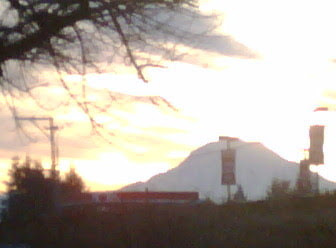 The Mountain was aglow and majestic...I NEVER tire of this view.. We stopped for a quick shot and headed back. Hard to believe that I have only know Tammy for a Year, the Fleet Feet training group starts next weekend I am not sure if I will sign up but I am sure I will bandit a few training runs.. After the run I came home to a sick Little Stud #1. We had plans to shop for couches so Tall Grandma came to our house, THANKS GRANDMA!! She took care of LS#1, including when he tossed his cookies...YUCK!! We found couches at Allen's Furniture in Enumclaw, WA.. TOTALLY recommend it for local folks, Jon was GREAT to work with.. Our new furniture arrives in 6-8 weeks in the fabric we selected...SO COOL!! Yesterday, Tall Grandma treated us to a trip to the Train expo at the local Museum.. LS#1 had a fun time, he wore the cute hat and loved the exhibits.. I got in the spirit and put on a funny hat :) Looking back on 2010 there were very good moments and days I struggle to even think about...but I will recap it all so I won't forget, this is my journal after all. Maybe I will have time to post tomorrow while Muscle Man watches football. UPDATE the Spreadsheet for the Tall Mom 1,000+++ Club. Also if you would post on your Blog with a link to Tall Mom and tell others about the Club and that it will open for 2011 on 1/3 that would be GREAT! Would love to have twice the number next year! 1. I was featured in a Wellness article at my work which meant I got to play running model for a day. Thankfully I forgot my nice running outfit that morning so Muscle Man brought me clothes...this gave us a chance to get some GREAT family photos... I used the photos this year for our photo Christmas card. 2. 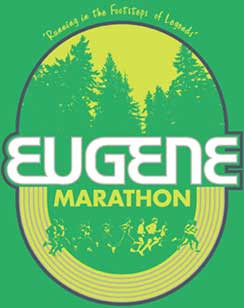 Many of you have expressed interest in the Eugene Marathon. I love love love the Eugene Marathon, read all about my 2010 BQ effort HERE. I got an email today that the price is going up on 1/1/2011!!! So save yourself some cash and commit NOW.. Register HERE, who knows I may just be cheering on the sidelines with SORE Boston legs..
3. Over a month ago I had some time so I flexed a little creativity muscle and put together a shirt shop on Spreadshirts.com....it is far from perfect and most of the shirt fabrics are not truly for running BUT.. If you are interested here are a couple of the products..
And if you like these go HERE to shop the other products. Sorry fellas I did not make any Man friendly styles YET.. Tall Grandma treated us all to a FUN trip to Great Wolf Lodge...pictures soon.. Tall Sister and Tall Grandma were AWESOME babysitters, letting Muscle Man and I play like kids.. THANK YOU!! We went on EVERYTHING!! Yes even the up to 4 person Tornado with a gut losing DROP into a half pike style area.. CRAZY!! I felt like I was in the X-Games.. The kids had a blast at the Water Park. Little Stud #1 was reunited with his Purple water slide he LOVED at age 2+ and Little Stud #2 had a Zen like relationship with the water fountains near the wave pool.. He was FUNNY, praying hands, then binocular hands, then talking to the water...not sure what he was up to.. a lady nearby thought he was doing Yoga, hmmmm. We had a SWEET room with a kids bunkstyle area, our little buddy was so sleepy at the end of day 1 he crashed instantly..
Needless to say I did not take too many photos, was having too much fun.. I am TIRED!! I should have counted how many steps it was with each trip UP to the slides. We got a GOOD workout.. back to running tomorrow, I have a 12K to get in before the new year. Have you reached your 1,000+++ miles?? Be sure to email me your address if you would like a bumper sticker.. Thanks to Peter HERE on Dailymile for the AWESOME photo!! I hope this post finds you with gifts wrapped, food cooking and a heart full of joy. the Holiday season is a wonderful time for family, friends and giving. I am BLESSED to spend last night with the in-laws, and tonight with family and friends..
How did I start Christmas Eve? We set out thinking we would catch the group, but Janna's knee started to lock up.. UGH!! I told her that we should walk to warm up a bit then stretch. The first downhill was about the slope of a Roller Coaster, what the?? And this was a gravel trail... Hmmm.. Thankfully I looked up info on the trail and wore my old shoes. Once Janna was ready we were off, SLOW, but moving along, Janna ran 17 the day before. It rained lightly, the trail was covered in branches from the high winds the previous week. I prayed I would not TRIP.. We passed a few people shouting "Merry Christmas" I wore holiday fuzzy socks, red and green, festive yes?? People probably think I am CRAZY, but hey I am ME. The hills kept rolling, up up up, down. GRAVITY grabbed me, my legs felt like tree stumps.. I realized we had only covered 2.8 miles..
"I hope that this is really a loop!" I said, since neither of us had ever been on the trail we were going in blind. Parts of the trail were lovely with lush green forests, large beautiful homes, peaceful and serene... the next section would be along the road, with creepy sheds and growling dogs, I would not want to run the trail solo. We saw very few runners, Janna joked that we would see the whole group as she dodged into the bushes for some relief. We laughed, cried, and had a NICE time.. It was in no way easy, but I kept my head up. We took it slow. In parts were were forced to go slow as MUD covered the path. At one point we were climbing the chain link fence that went the length of the trail. Grasping the fence so we would no have thick mud up to our ankles. As it was our shoes were pretty muddy. It was difficult to get a good pace because when the mud sections came we would have to tip toe around or have sloshy sneakers. We saw about 4 runners in the distance behind us and sped up. Janna's knee had warmed up and she was ready to be DONE. We zoomed the last 2 miles and made it back to the car just as the rain picked up. AGAIN we missed the Marathon Maniac group... UGH!! Oh well, maybe next time. We stopped to take pictures on the way out, will post those soon.. All in all an amazing way to start my Christmas Eve. Tall Mom- LOGGING off for a few days! The last 2 days I have run with my BOYS!! 3 milers in the gloomy rainy Seattle weather.. Tall Grandma was at the house and offered to watch the boys. Muscle Man wore blue, I wore pink, not on purpose but it made me laugh. We went a conversational pace and took on the HILLS. Generally we avoid the uphills with the Double Jogger. 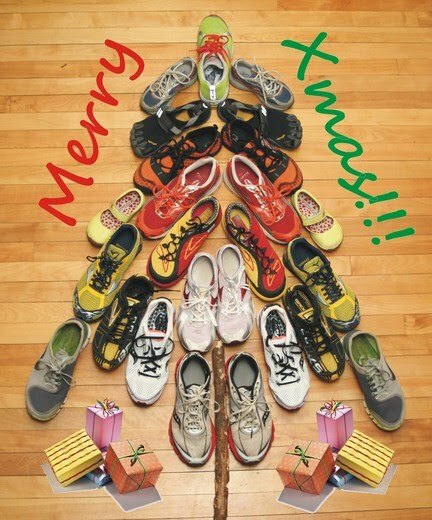 I feel so blessed to have a husband with an interest in running. 2011 will be a BIG year for him and he is getting started now on the pavement building some base miles. It took me a while to get my CPR and First Aid required to complete my RRCA Coaching certification. On Tuesday night I had an American Red Cross instructor all to myself, and passed the class with flying colors. I think that EVERYONE should be certified in CPR and First Aid, it gives you amazing peace of mind knowing that you may be able to access a situation and make a difference. Call me Coach Tall Mom. If only I had extra time to commit to a small business. In 2011 I plan to practice building training plans for Muscle Man, Chelsea and a few other friends.. Once I feel confident I may be expanding, will keep you posted :) I am hoping to start classes on Mental Running and maybe plan small local race or training group. Time will tell..
Christmas Eve!! wow.. I am going with Janna to a local Marathon Maniacs run, should be a good time.. 10 miles to get the holiday season going.. I am taking it a little easy, back in Marathon training before you know it.. I have been struggling with a DECISION.. 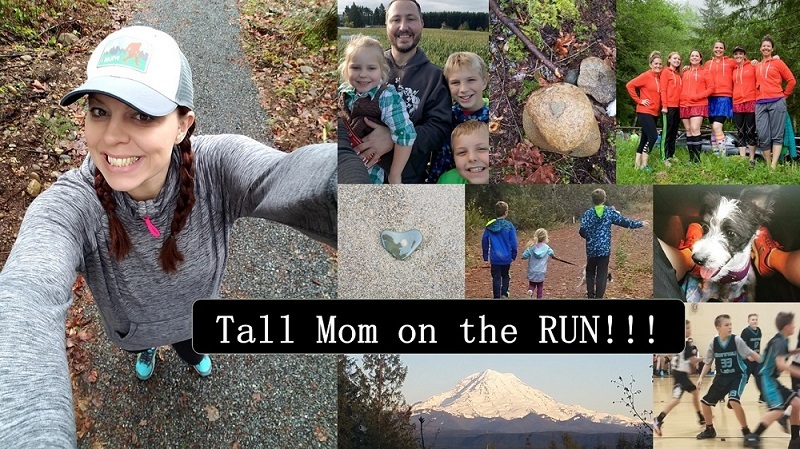 I think many Mom Runners may have the same struggle when it comes to Marathon training..
Time with Family vs. Marathon!!! And for me the Marathon up next is Boston... 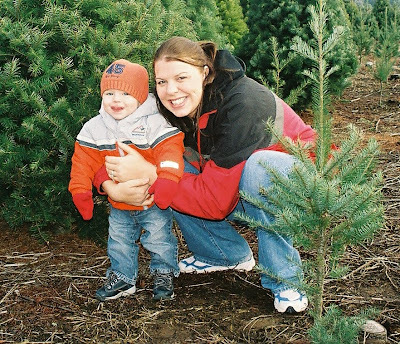 When my Dad died I took a long look at my life, my priorities and how I spend my time. When I missed registering for Boston because we were planning his funeral arrangements I took it as a sign.. And my back and forth began..
-You did not get into Boston, that is a sign that it is best you don't do it this year. -Jill got you an entry, that is a sign you should do it. -Las Vegas Marathon was tough, maybe you need a break. -Boston is something to look forward to and Dad would not want you to quit. -Muscle Man wants to train for a Half Marathon, you should focus on helping him train and time with family. -You can run Boston for those who may never be able to and tell the story so they can be there with you. -It is too much pressure, too much time, too much money, I am not sure that I have it in me right now. -But what if you never qualify again? This is the time to do it for YOU. -Boston Entry came, that is a sign. -Invitational Entry is $250!!! Why is it twice the price, UGH!! 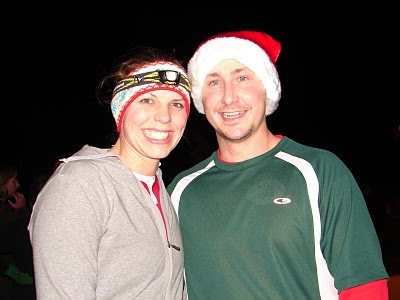 -Bethany and Ryan at "Our Love on the Run" HERE have offered to host so you are already saving $$$. It would just be the flight, entry fee and some spending money..
-Email to friends asking their thoughts, 50/50 reply, but the overall consensus is "go with your heart/gut." -My heart is still a little tender and my gut is out of shape... DECISION making ability is not a strength right now. -Ask Mom.. Mom thinks I should do it. I told her I felt guilty like my running had taken away time with Dad... She reminded me that they were off traveling the country enjoying their hobbies.. Ultimately I realized that I wanted his approval, for my partner in life to tell me that it is OK for me to spend the time, money and effort reaching for a dream.. And he DID!! Moral of the story?? As a Mom and Runner having the love and support from your partner is the first step in fully committing to Marathon training. I am BLESSED to have a husband who cooks "CARBO LOADING" meals on Friday nights, accepts that I wont be there on Saturday mornings and will massage my tired legs on a lazy Sunday. Does it take away time and money from the family? Yes... But I believe that through my passion I am giving back so much more..
Off to fill out the entry form and send $250 (OUCH) if I could only get a sponsor!! Here is to hoping I get in, and if not... I guess I have my answer. 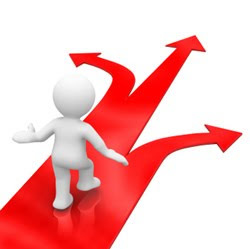 What Decisions do you struggle with? How do you ultimately come to a conclusion? 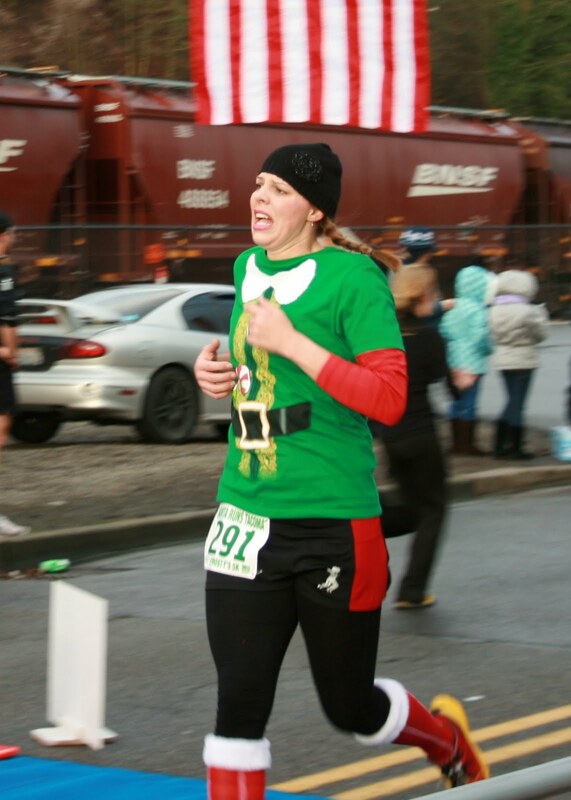 Here is a little preview of the FUN I had at the Santa Runs Tacoma 5k today.. Race report and a BUNCH of photos soon.. I will upload some on my facebook page in a few hours if you are interested..
4. Homemade costumes are great, but REMEMBER you have to run 3.1++ miles so make sure it is comfortable. Yes folks this weekend I will put on my ELF costume (ironic yes?) with silly socks from Janna and lace up the Brooks for a 5K jaunt around T-Town!! The Santa Runs Tacoma has a great turnout in alpha order Alma, Amy, Chelsea, Janna, Jill, Kadie, Kerrie and kiddos... Heidi and Tammy will be volunteering and cheering.. hopefully weather depending Muscle Man and the Little Studs will also make an appearance. GOOD TIMES!! Last night I hit the treadmill for a warmup 5K to see how my 11 days Post Marathon legs felt. I started slow, I have not done speedwork at all and I don't want to get injured. I knew I wanted to get a sub 27 minute 5K. I had Top Chef and the Little Studs to keep me company. I felt HEAVY!! That extra 10 pounds I have gained bounces and I DON'T LIKE IT!! Think I need to start my New Years Diet early. As I warmed up I felt good, HOT but good. Time to get a fan to go with the Treadmill. By the end I was going sub 7 minute pace ending with a 26:15 5K.. Not too shabby. I am going to pulse my friends to see what their plans are.. then I will either pace someone to a PR and HAVE FUN!! Or try for about 7:30 Average pace.. going for a personal PR right now is not realistic. Are you running this weekend?? In costume? What are your FUN Holiday plans? 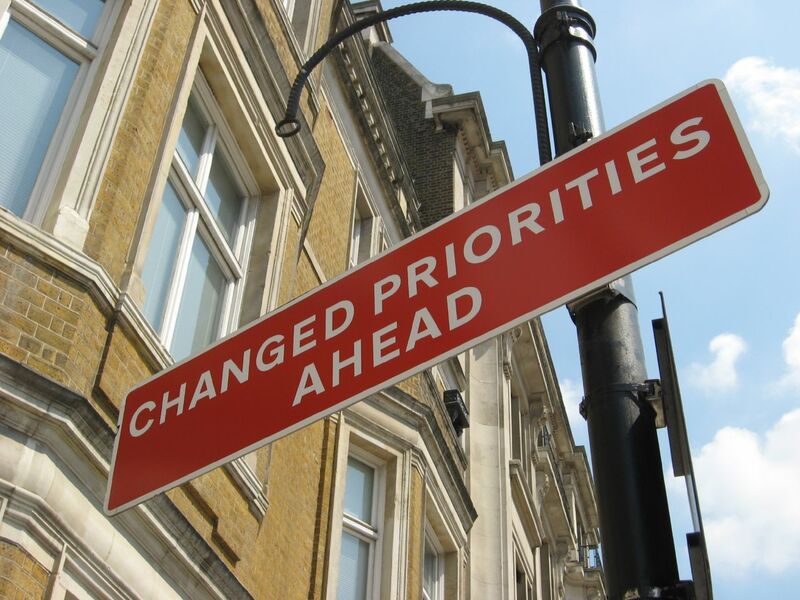 “Goals are simply tools to focus your energy in positive directions, these can be changed as your priorities change, new one added, and others dropped."